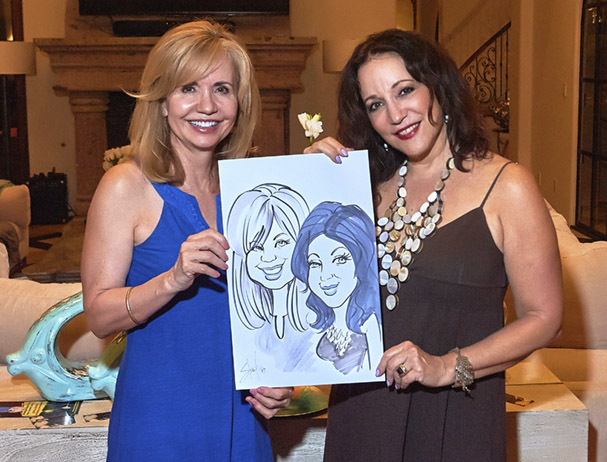 Hand picked artists who draw flattering caricatures that make your guests feel like VIPs. Your reception will be more fun and more unique or I’ll refund your money. Comic book artist discovers how to have a fun and unique wedding. According to St. Louis Bride & Groom Magazine, 81% of wedding guests said, the thing they remember most about a wedding is the entertainment. Think of it this way, your guests get dressed, plan, travel, and spend money to attend your big day. The least you can do is rewarding them by narrowing down the wedding details that your guests will actually care about. You need something easy that ANYONE can do, something that can encourage mingling. This is where caricature comes in. I’ll be honest, even my mother-in-law first said caricatures at weddings is, “tacky.” She didn’t understand what I did at weddings BUT she found out quickly. Yes! I’m not your average caricature artist. Did I mention I used to be a pinup artist? I don’t just draw cartoons, I lift what sags, take away wrinkles, and excess pounds, and make you feel like a VIP. My mother-in-law loves what I do now but you don’t have to take her word for it. Caricature was featured on the Huffington Post’s 27 Genius Wedding Ideas Your Guests Will Talk About For Years To Come. And Wedding Wire listed caricature as a way to impress your guests and make your wedding more unique. Caricature is a simple process. You sit down, maybe at cocktail hour or during the reception. You have a little conversation with the me and your portrait is done in about five minutes. Your guests enjoy receiving the 11” x 17” party favor and others enjoy watching the process but it doesn’t stop there. Once the drawing gets back to the table it becomes an ice breaker and guest have more to talk about (which is really great for people who do not know each other). Your wedding will be more fun and unique or I’ll refund your money! For less than it costs for hors d'oeuvres at cocktail hour, you can have me drawing caricatures at your ENTIRE wedding. And here’s the kicker, there is no risk! I guarantee my work and anyone on my art team. If your guests don’t stay longer and have more fun at your wedding I will refund 100% of your money. Contact us today to see if your date and which artists are available!